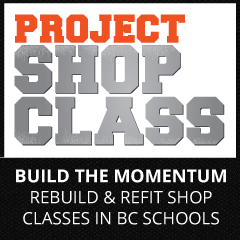 In 2014 the Construction Foundation of BC took action to rebuild shop class in British Columbia by offering grants to BC’s high schools and school districts. Their goal was to encourage more young British Columbians to pursue a career in the trades. Interested BC high schools and school districts submitted their applications in order to be considered for grant funding. The Construction Foundation of BC is the philanthropic arm of the British Columbia Construction Association (BCCA). The Foundation was created to encourage and support good works on behalf of the province’s construction sector – including a major emphasis on supporting industry training.